Many of us love watching random videos on YouTube and when we like a particular video, we usually share it with out friends on social networks. However, most of the time when we share a YouTube video, we do not intend everyone to watch the whole video, rather its a specific portion of the video which we actually want others to view. So how do you share a video which starts at a specific time? Well, YouTube has already taken care of this. If you ever need to share a YouTube video which starts at a specific time, here are two methods by which you can do so. 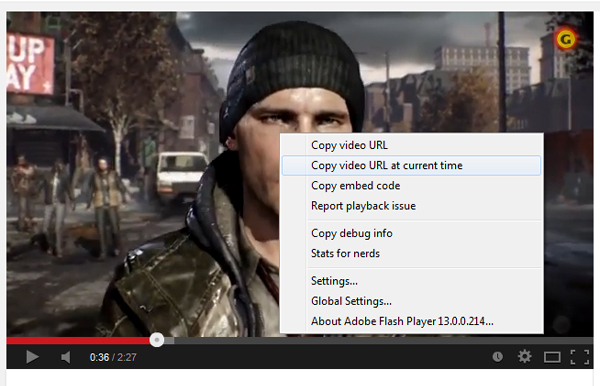 Step 2: Right click on the video and select Copy video URL at current time. That’s it, now the link to the specific portion of the YouTube video will be copied to the clipboard. Paste it anywhere and share it with your friends. The YouTube video will start exactly at the point from where you wanted it to start from. Well, that was the easy way of sharing YouTube videos which start from a specific time, there is another method as well. The second method makes use of the “ #t=1m10s ” tag, wherein you will need to specify the minutes and seconds from which you want the video to start from.